For floors that are difficult to coat (such as porcelain tubs and other non-porous surfaces), we highly recommend using UniBond 110 as a primer before applying SolidStepCote. *no shipping for orders over $120!! SolidStepCote (SSC) is an anti-slip abrasive paint-on floor coating that can be applied using a paint roller, foam brush, or low pressure airless spray equipment. A GREEN product, it is a water-based, non-toxic and crystal clear non-slip coating product (with built in UV protection) that is available in three unique, durable and affordable grit sizes that will enhance the beauty of any surface while protecting you, your family, employees and customers from slip and fall injuries even under wet or oily conditions! It makes the perfect slippery tub solution. All our anti-slip floor coatings are super easy to apply, tested for slip resistance, and suitable for many uses including, but not limited to: home and hospital bathrooms and showers, external walkways, swimming pool decks, etc. For commercial and industrial situations, we recommend our SparkleTuff™ Anti-Slip Floor Coating because of its extreme durability. The smaller grit in “SSC 02” makes less of an impact on the appearance of the flooring and is best for entry foyers and lobbies where appearance is of great concern. The medium sized grit in “SSC 03” is ideal for bathtubs, patios, shower rooms and pool decks where bare feet will be wet. The large grit in our “SSC 04” makes it perfect for industrial applications. Click on the photo to the right to enlarge. It shows the three grit sizes in direct overhead fluorescent lighting. 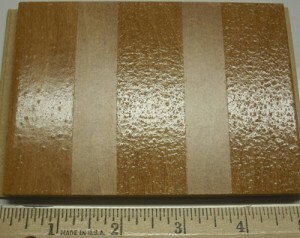 In natural and other types of lighting, the coating is very hard to see. Want more photos? Click on close-ups & from above. All three grit sizes produce a floor that passes the ANSI B101.3 and pendulum slip resistance tests. What that means is whichever grit size you choose, you can rest assured your floor will be anti-slip and look beautiful and glossy too! We recommend using two coats of SolidStepCote, waiting 20-30 minutes between applying coats. Here are the application instructions and MSDS (or SDS) for SolidStepCote anti-slip abrasive coatings. Check out our shipping rates – they are ridiculously cheap and simple. We can also add color to this anti-slip abrasive coating – white or any other color – for $15 per gallon. Please call if you’d like any color other than clear. This clear anti-slip floor paint creates a great slippery tub solution. 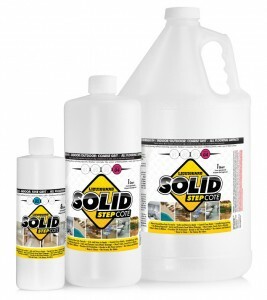 We also carry 4 and 8 ounce bottles of SolidStepCote in a ready-to-go complete kit which includes a small paint roller and tray ideal for coating bathtubs and showers in your home. 4 oz. 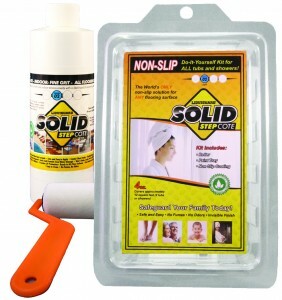 will cover one normal bathtub with two coats.Buy the SolidStepCote Ready-To-Go Complete Kit with the 4 or 8 ounce bottle, the paint roller and paint tray in one easy package. For more information, here is a SolidStepCote flyer. Area coverages are approximate and may depend on the texture and porosity of the surface. Please call 949-582-0889 for orders over 5 gallons. Looking for a “green” paint stripper for stripping some SolidStepCote? BioStrip paint stripper is the answer!